Illinois Reads has chosen THE MIRROR THIEF as one of its 2018 titles for adult readers, to be featured on a statewide basis through outreach to libraries and retailers. A project of the Illinois Reading Council, Illinois Reads seeks to encourage and promote reading as a lifelong pursuit. Each year Illinois Reads recommends books by Illinois authors for readers of all ages and grade levels. By happy coincidence, the 2018 list for adult readers also includes LILLIAN BOXFISH TAKES A WALK by Martin’s spouse Kathleen Rooney, as well as novels by Allison Pataki, Michael Harvey, and Leslie Parry. 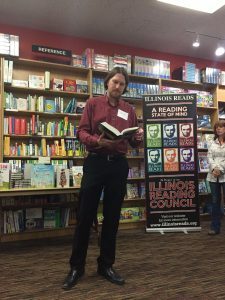 The 2018 Illinois Reads campaign kicked off with a sneak-peak event at Anderson’s Bookshop‘s Downers Grove location (photo above, courtesy of Illinois Reads), and events will continue throughout the year.